Always on the lookout for trends in customer service: the Qudini team have been researching the use of robots in retail. This year at RBTE we came across SoftBank’s “Pepper”, a robot sales associate powered using IBMs Watson. Watson is an artificial intelligence platform that has the capacity to learn information. Using the AI technology, SoftBank have built a customer service robot that is able to communicate with customers and even read human emotion (the first robot to do so), for the benefit of providing customers with information, way finding and giving advice. Pepper is used within Nestle cafes in Japan to provide customers with information about products and is soon to be used in USA locations. Yet the views about the benefits of using robots in this setting, particularly if they are to become a substitute for people, are contentious. Con: On the other hand, we can also get annoyed and mistrust online content when its agenda is so blatant and unsubtle. Can a computer that can read human emotions also temper its responses to ensure subtlety in the information it provides to assist a sale? Pro: Computers can retain more accurate information. When helping customers in a retail environment this will ensure customers can get the most accurate and up to date information on products and services they wish to buy. Information is always useful. Con: But ultimately we make most purchasing decisions from the heart and peer review is also becoming more and more important. When a sales conversation is with an advisor they are able to construct an engaging narrative around a product and why it’s good (Perhaps because they or their friends use it). Tugging at our heart strings before we open our purse strings. Would robots be able to engage with products in the same emotional way? Con: And if they tried to engage emotionally, will we ever trust robots as much as we trust people, with people we know we can read nuances in their expressions and build relationships with them through empathy. 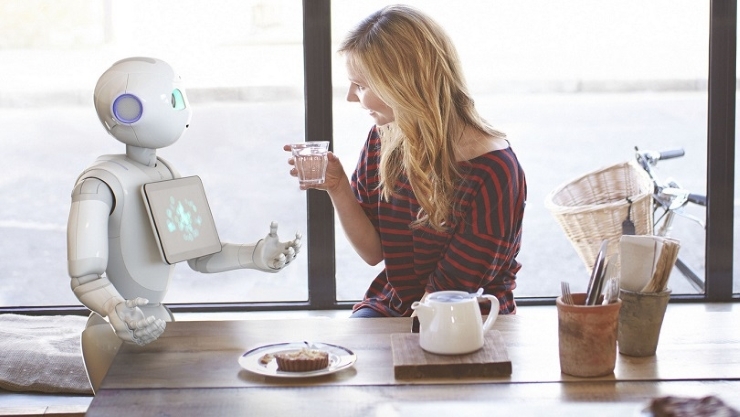 Whereas robots like pepper might be able to read our emotions, but any empathy they project back is an algorithm. Will people trust it.? Insight: To us at Qudini, the additional product information that a robot could provide, therefore seems to act as a great supplement to the narrative that an advisor can construct around a product. Pro: Some kind of advisor or greeter is better than no advisor; in large busy stores it’s not possible to have advisors all day all over the store and attending to customers through technology is better than not giving them alternative source. That’s the main reason we’ve developed Qudini. Pro: In large stores, a lot of staff time is taken up helping customers with wayfinding and navigating their way through aisles to find the products they need. If robots were used for tasks like wayfinding and basic information, could this help free up the staff time to better build relationships with customers? Con: But is helping customers wayfind a really good opportunity for staff to initiate conversation and build relationships, and would this opportunity be missed if robots took over it. Might Using robots for customer facing roles, loose many opportunities to build customer relationships, and in this case would it be better investing the money in back-office technologies that will help free up resource to the shop floor? Con: “People buy people”, and people are a brand’s key representatives. One of the key parts of engaging with a retailers bricks and mortar location is to build relationships with people. Will “people buy robots” in the same way? Will robots be able to become representatives of retailers’ brands, or in other words, will SoftBank be able to customise its robots projected personalities to represent the personality of the brand? Or might customers become offended by robots replacing people and feel that the brand is engaging in a cost cutting exercise that neglects investment in its customer relationships. It’s certainly an interesting space and one to watch. At Qudini, we’re very excited by the potential of robots to be able to compliment staff in stores to help retailers better deploy resources to the activities that matter such as building customer relationship.